Roland's new video converters address the demand for high-quality, lossless video and audio converters for live/post production as well as installed systems. 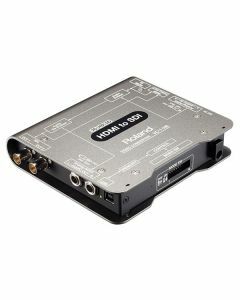 The VC-1-HS is a HDMI to SDI Converter. Increasingly HDMI video cameras are being used for live production. The VC-1-HS converts, extends and embeds audio from HDMI to SDI. This converter is especially complimentary to the Roland V-1600HD and V-800HD multi-format video mixers when you want to use SDI signals for camera inputs on the mixer.